Digital Transformation – How to go about it. Businesses across the world are using digital advancements like mobility, analytics, social media and smart devices – and improving the use of traditional technologies such as ERP – to manage customer relationships, internal processes, and value propositions. Most businesses have a corporate strategy, where there is a gap between strategy and execution. In the course of digital transformation, businesses fail to identify these gaps, as a result of which the results achieved are not as expected. The answer lies in the identification of the factors causing these gaps between strategy and execution and working towards correcting the same. Figuring out what digital means for the business is hard enough. Translating that into action items, in what order and subsequently driving the enterprise-wide transformation makes for an even more daunting challenge. Companies face common pressures from customers, employees and competitors to begin or speed up their digital transformation. They are, however, transforming at different paces with different results. Focus on the “how” more than the “what.” The most successful transformations focus on how to drive change as on the detailed content of the change. There is no need of creating a new organization for a Successful Digital Transformation, but from reshaping the organization to take advantage of valuable existing strategic assets in new ways, bridging the gaps that arise between strategy and execution. Organizations can do much more to gain value from the existing investments they have made, even as they envision radically new ways of working. One of the first steps in the Digital Transformation Process is Process Transformation. The most efficient way derived using the Quantitative Business Process Modelling Framework (QBPM). The QBPM Framework and Tool elevates a company’s business chain into a value chain and reconfigures the business processes to maximize the business value. This is accomplished by identifying value leaks, value-add areas and comparing the current state with the best in breed practices, identifying KRAs’, corresponding KPIs’ and benchmarking them. It facilitates deep dive analysis into the original intent of the company by quantifying the vision, mission, objectives, goals, targets, and drivers and assesses the current state of the company as compared to the original intent and the desired position in the next few years with a roadmap. QBPM also identifies the factors that contribute to the gap between strategy and execution and directs towards minimizing the gap. In a nutshell, QBPM creates an environment in which the processes are world class, adhering to the best, are robust and lays a firm foundation towards realizing the business objectives. After ensuring that the processes are in place and the business chain has been converted to a value chain, the need to automate these processes cannot be over-emphasized. Organizations like to have ERP solutions not just as transaction processing systems but also as a Tactical Planner and Strategic tool. The connector to the ERP system is the second step in the Digital Transformation Process with the modified processes configured in the ERP system and the ERP acting as a perfect reflection of the business chain. Besides executing all business transactions in an integrated and seamless environment, it also converts the data into information and alerts. While the underlying ERP applications and other sources produce volumes of data on a continuous basis, we need to combine the data that gets generated from all the sources – in structured, semi-structured and unstructured (data from DCS, sensors, IoT, social media, text, voice) form. The aggregated data then needs to be converted into information and is then transformed into interpretation and finally into action items, insights, wisdom and knowledge. This is of utmost importance in taking prompt, accurate and timely decisions across operations, planning, and strategic levels. Mere conversion of Data into information has huge limitations, and unless we learn the trends, patterns and the hidden messages in the past data, we can’t leverage the power of forecasting, optimization, prediction and simulation into the Business. 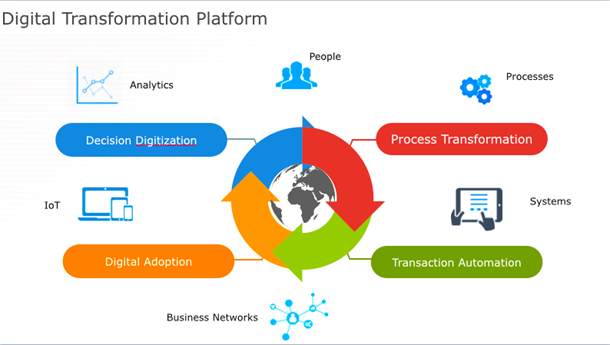 The 3rd and 4th stages of the Digital Transformation Process that are Digital Adoption and Decision Digitisation enable the company to connect with all external sources to distill the data as required and combine this data to drive the organization towards decisions, to become Proactive and Preemptive. Decision Digitisation also has Business insights, readymade solutions for areas like Spend, Inventory, Demand, CAPEX spend, MRP, Transport cost, Production scheduling, NPA prediction, Liquidity forecasting, customer churn, opportunity conversion likelihood, Employee lifecycle, Working capital management, NPM maximization, etc. and subject the data to statistical modeling. 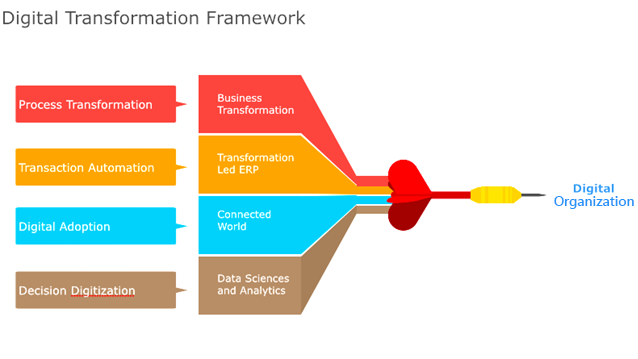 The Digital Transformation Platform should, however, combine the process transformation with the ERP, connectors to Analytics Platform – all 4 of them drawing strength mutually to provide a complete single instance that allows for branching off to all relevant internal and external sources. It must also address all the aspects that a Business needs in this Digital age to become a Digitally Transformed Organization. Digital business transformation is about smarter performance. Whether using new or traditional technologies, the key to digital transformation is re-envisioning and driving change in how the company operates. This is not a technological challenge, but management and people challenge. Many digital transformation initiatives fail to capture all the value available to them because their vision is not transformative. The real value of transformation often comes from seeing value across silos and then helping everyone else see that value.